Back in the early days of the web, it was enough for a company to just throw up a website that was nothing more than an online brochure. In those days, the value of a website was not yet fully understood. And yet, even at that early stage - before the ubiquity of quantitative measurement tools like Google Analytics - website owners were trying to figure out how well their site was performing. They would include “hit counters” at the bottom of the page. Times have certainly changed, but website owners today still grapple with performance measurement. When pressed to clearly articulate the value that the site delivers for the organization, they struggle. Most often this is because clear goals were not established at the outset of the project. When thinking about goals, I often think about it in the context of a voyage at sea. You certainly wouldn’t just hop aboard the boat and go for a ride. The first thing you would do - if you were a serious sailor - is chart your course. If you don’t chart your course, taking things into consideration like weather conditions, you and your boat will ultimately become a victim of circumstance. You will drift where ever the wind, and the sea takes you. The same can be said about your business. If you don’t captain the ship and set an appropriate course (i.e. with goals), you will get caught up in the chaotic and random happenings of the day-to-day that are out of your control. So, then, how do you avoid the drift? Take stock of your current location/position - this is important because it gives your goals context. How can you decide where to go if you don’t yet know where you are? Decide where you want to go - once you understand where you are, you can then begin plotting the course for your journey. This is the primary focus of this post, setting website goals for your business. Start moving toward your destination - once your goals are clearly articulated (and documented! ), it’s time to get the crew on board and set sail for your destination. When it comes to setting goals for your website, the specific metrics you capture, and the targets you set, should be a reflection of the company's larger goals. For example, if one of the marketing goals of the company is to “increase brand awareness”, you might measure things like unique visitors and page views. Increases in those metrics would logically correspond to an increase in overall awareness of your products and/or services online. Further, if the business’ goal is to increase overall engagement with customers, you might measure things like bounce rate, time spent on site, or total number of email subscribers. These are measures of the level to which site visitors are interacting and engaging with the site. Finally, if the business goals are more revenue driven, a completely different set of metrics comes into play. Things like page views, and unique visitors would be important, but would almost be secondary to metrics like total number of leads captured, and the rate of conversion of website visitors into leads, or leads into customers. Now that you’ve reflected on how your website can support larger organizational objectives, it’s time to set some goals. One of the most popular frameworks, or models, for setting goals is the SMART criteria. SMART is an acronym (S = Specific, M = Measurable, A = Attainable, R = Relevant, T = Time-bound), giving specific criteria to guide in the setting of goals. Specific - what would you like to accomplish? In terms of marketing, you should choose the particular metric you want to improve, like page views, visitors, or leads. The more specific you set your goals, the better grip you have of what you’re aiming to accomplish. As you formulate a goal, think about how you will verify it. Avoid ambiguous words like minimize, maximize, etc. as those terms cannot be verified quantitatively. Measurable - How will you know it’s accomplished? If you want to gauge your team’s progress, you need to quantify your goals, like achieving an X percentage increase in visitors, or leads. Again, avoid ambiguous terminology user-friendly, as that is not something that can be verified quantitatively. Attainable - Can it be realistically accomplished? This is where self-evaluation of your company’s current position (noted above) will come into play. Make sure your your targets are rooted in reality. If your website traffic increased by 5% last month, it’s likely NOT realistic to increase it by 25% next month. When evaluating how realistic your goals are, you should always base them off of your own analytics. 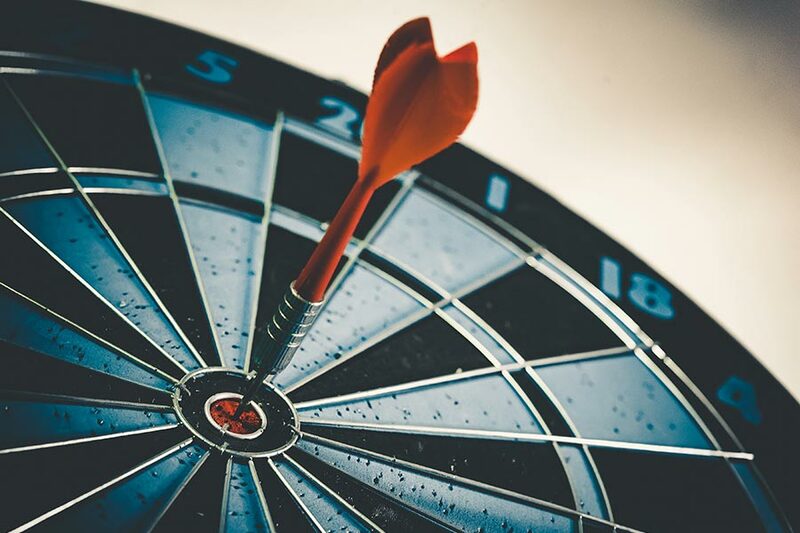 While not ideal, In the absence of any meaningful data of your own, you can fall back on industry benchmarks to help you set realistic targets. Relevant - Will accomplishing this goal actually help your business? Your goals needs to relate to your company’s overall goals and address core business and brand objectives. Further, account for trends in your industry. Time-bound - When would you like this to be accomplished? Attaching deadlines to your goals puts pressure on your team to accomplish them. And this helps you make consistent and significant progress in the long term. If you don’t give yourself a deadline, accomplishing your goal will take too long to achieve long-term success. To help get you started thinking about the types of goals that are relevant to your business, we’ve included some examples below. Keep in mind that this list is not all-inclusive, and you should target the appropriate metrics that are meaningful to your business even if you don’t find them in the list below. Pageviews - a page view is an instance of a page being loaded (or reloaded) in a web browser. Pageviews is a metric defined as the total number of pages viewed within a measurement period. Generally speaking, page views are a good indication of the overall consumption level of the site (by all visitors). As this value increases over time, you can assume that either a) more people are viewing pages on your site, or b) the same amount of people are viewing more pages. Unique visitors / users - the users metric show how many users engaged with your site within a defined measurement period. Most marketers believe that the users metric is more valuable than page views, and that’s because the number of users gives you a real sense for how many people your site has reached within a given time frame. Bounce rate - a “bounce” is defined as a single-page session on your site. In other words, someone visited one page on your site and then clicked the back button, closed their browser, or navigated to another site. Bounce rate then, is the percentage of single page visits. Theoretically, the lower the bounce rate, the more engaging the site is, overall. Meaning, site visitors find the site interesting enough to click on more than one page before leaving. Keyword ranking - the objective of optimizing a site for the search engines is to rank as high as possible on the search engine results pages (SERPs) in the hopes that users will follow that link to your site and consume your content. You achieve this by identifying topics, or keywords, that you know your customers will be searching for and then create compelling content around those keywords. You can use tools like Moz’s Keyword Explorer to research keyword phrases that are relevant to your business than then track your site ranking over time. Back links - a back link is a link that one website gets from another. The search engines interpret this as a nod to a particular sites authority. If the content on that site is good enough for another site to link to it, then it must be pretty good. You can use Moz’s Link Explorer (the replacement for Open Site Explorer) tool to research how many links your site currently gets and track those values over time. Business performance metrics - to help you understand how your website is delivering revenue for the organization. Leads - this is a site visitor who has shown interest in your company in some way, shape or form. Most commonly, these are visitors who have shared personal contact information with you (their name and email address, for example) in exchange for information or a premium content offer from you. For any company selling products or services, leads are life blood of their business. As these are the individuals who are ultimately converted into paying customers. The more leads you can generate over time, the better change you have to generate more revenue for the company. Conversion rate - a conversion rate is the percentage of website visitors who take a desired action. The most common example of this is the percentage of visitors who buy something on a site (i.e. customer conversion rate). However, conversions aren’t just limited to e-commerce sites. You can measure the rate of conversion for any action on your site. For example, lead conversion, email subscriber conversion, etc. Ultimately what the conversion rate tells you is how effective your site is at getting the visitor to take the desired action. Over time, the conversion rate is typically more important than the conversion count. The final step in the goal-setting process is to document the goals. That’s right, jot them down and share them with the rest of the project team or other relevant stakeholders. In doing this, you are driving alignment with the project team. Further, much research has been done proving that the simple act of writing down your goals increases your chances of achieving them.